Published by The Finnish Comics Society and Huuda Huuda Artists featured: Terhi Ekebom: In New Territories (originally published 2005) Matti Hagelberg: The Poor People (originally published 2010) Grönroos & Rantio: Mr Bear, Barbie, Hannah, Eye Drops (originally published 1998) Pauli Kallio & Mika Lietzen: The Florist’s Lucky Day (originally published 2005) Tarmo Koivisto: Room for Youth (originally published 1980) Mika Lietzen: A Story from a Street (originally published 2007) Petteri Tikkanen: Heather and One Thing (originally published 2007) Tiitu Takalo: It’s a Wonderful life (originally published 2010) Katja Tukiainen: Mademoiselle Good Heavens III (originally exhibited 2010) Riitta Uusitalo: Piglet’s Kids (originally published 1996) Abstract from Reija Sann’s foreword: Putting together an anthology is always difficult. The task itself is a complicated one, and to top that there are usually masses of guidelines, wishes and limitations presented by the publisher. Well. Not this time. I was given some 200 and more pages to fill, with just the advice to “make it look like YOU” and that I should use works that have not been translated before. People, I tell you that there are not many things scarier than total freedom. The first thing I was able to decide upon was that I decidedly wanted to make use of the anthology’s large format and include longer novels in it. My wish was to create a peaceful tempo to the book, one that hopefully allows the reader to stop and really concentrate on each novel. Along this decision, also certain type of novels stood up as candidates. All the works in this selection have a strong narrative. The written word and manuscript play an important role in them, alongside the graphic element. On the other hand, each artist in this book does have a radically individual graphic voice. Each one of them unites word and picture in a unique way. This makes their way of carrying a story very different. Most of the novels and strips in this book have, at least in my opinion, a very strong Finnish flavour in them, either in their setting or in their subject (or in the melancholy/crazy way that it is portrayed in). That was actually criterion number two when I was choosing works for the annual. 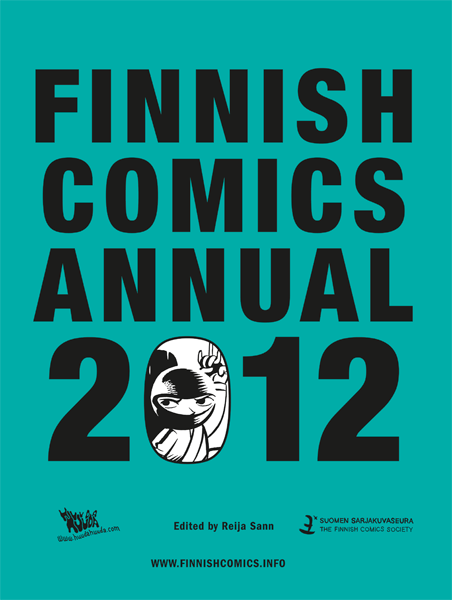 Why, apart from the title being called “Finnish Comics Annual”? Because I was irritated. During the years I have heard time after time that this or that book or strip is too local to interest a wider audience outside our borders. This attitude has perhaps changed a bit, as ethnic themes have become more popular for example in literature and films all around the world. But when people are talking about comics, for some reason this annoying opinion still keeps obstinately popping up. Finnish everyday life – not interesting! The argument is odd to me. Firstly, because everything is local – it is simply not possible to escape one’s background and long-time environment in creative work. From this point of view locality is something very global. As for me, locality is an inducement, not a repellent. Name an artistic work that has little connection to the culture it comes from? Let’s double the stakes: name one that is interesting. Ha haa. On the other hand, our world is getting smaller and smaller and the same environmental and ecological powers haul us poor folks around. People from different cultures share the same experiences more and more. If there still is a culture with a reality, atmosphere and outlook on life that remains truly unique, aren’t we only curious to learn about it? Read the book and then tell me. The third reason I selected just these stories is that they all talk about belonging, either belonging together with another person or to one’s community. Or then about not-belonging: loosing that vital connection with other living things and then, somehow, finding it again. From Heather’s efforts to save her granny to Uusitalo’s enthusiastic football amateurs, from Koivisto’s simple small town people facing radical changes to Hagelberg’s static world with little mercy, people strive towards each other. In a Finnish, harsh landscape, and sometimes with little hope of succeeding. And other times laughing out loud, the flag of rebellion bravely hoisted.